Cut squash in half and rub with olive oil. Place all four halves (skin side up) on a parchment lined baking sheet. Bake for 50 minutes then remove from oven and allow to sit for an additional 10 minutes. Using a spoon, remove seeds (discard) and then using a large serving fork, scrape out inside of squash into a large mixing bowl. The threads will look like spaghetti strands. Add butter and pepper and mix to separated strands. Heat the tomatoes and black eye peas in 2 different bowls. 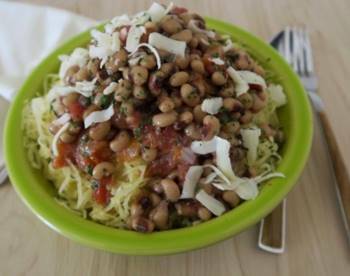 Divide spaghetti squash between 4 heated plates and top with first the tomatoes and then the black eye peas. Grate Parmesan cheese over the top before serving.